View of the duplex and front door. Alderman`s very large shared drive way. Living Room Living Room with two Lazy Boy couches that both pullout to full beds. Living area with 46 flat screen TV with cable and DVD player. Dining Room set for six. Fully equipped kitchen. First Bedroom with a queen bed. Second Bedroom with a queen bed. Shared bathroom with shower and bathtub. Back patio area with seating. Great for BBQ`s. Come to June Lake for the abundant fishing, exceptional skiing, and breathtaking views. June Lake offers relaxation for every season. In the warm months enjoy hiking, biking, boating, climbing, and of course, trout fishing. You can also explore the old west at Bodie State Park, the local ghost town, or discover the vast wilderness that makes up Yosemite National Park. With springtime comes colorful wildflowers and autumn changes the landscapes to brilliant gold, yellow, and orange. During the snowy months, June Mountain ski resort has wide open runs, and kids under 12 ski free! This unit is also only a 20-minute drive from world famous Mammoth Mountain. When fishing season is closed during the winter on the June Lake Loop, you can still take a short drive to the Owens River, East Walker River, and Bishop to fish all year long. 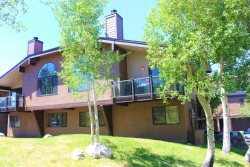 Speaking of fishing, this duplex is located 2 blocks from the June Lake Marina, and 2 Blocks to the village. Enter this cozy duplex and you will find you first room to your left, with a queen bed. Going further down the hall, one comes to a living room complete with two pullout couches, TV, DVD player, and wood burning fireplace. There is also a dining room table that seats 6. Off of the living room is another room with a queen bed. Walk up a couple stairs to the fully equipped kitchen and two full bathrooms. There is also a porch with a gas BBQ, small lawn, and outside table with chairs. The personnel in the office were great. The location is the best for us. In the middle of the two lakes. We had stayed in this spot 2 years ago and were returning customers. Big driveway. Quiet. If we had neighbors we didn't hear anything. Having cable was nice. The kitchen was well equipped. There were plenty of pillows and blankets. Staff was friendly and knowledgeable and was willing to assist us if needed. The rental was more than my expectations. After having tent/trailer camped for the last 16 years, my family and I were extremely pleased with the accommodations. Reservations, check in and check out were all easy - the staff, as always, was awesome! We love staying here and will book again soon! Very friendly with good humor. Everything was ready for us. We had everything we needed ... worry free for a busy mom. Great job, your housekeeping crew/ maintenance crew are doing a great job with upkeep of the property. Keep up the great job! Members of the team were very nice. We thoroughly enjoyed our first visit to June Lake. The house was very nice. We would like to bring our friends and family next year. We really appreciate the allowance of pets. The accommodations were perfect for our needs. Comfortable and cozy. Great vacation. The staff is ALWAYS friendly and very helpful, both before and during our stay! Can't say enough about how we enjoyed our week in the Eastern Sierra this year! Great staff very friendly and make you feel like at home. Great property to rent. Close walking distance to both June and Gull lakes. Your team were excellent to work with. The house was clean and a delight to stay at. The upgrades made were nice. Team members are courtious, professional, 5 star service providers. Clean, immaculate, spacious, accommodating for our large family, with everything you normally have in your own home!